Makino’s goal is to revolutionize the way manufacturers think about titanium machining. Engineers at Makino’s Global Titanium R&D Center are continuously researching titanium processing solutions in a wide variety of applications for all industries. At TiMachining.com, visitors can follow Makino’s latest breakthroughs. 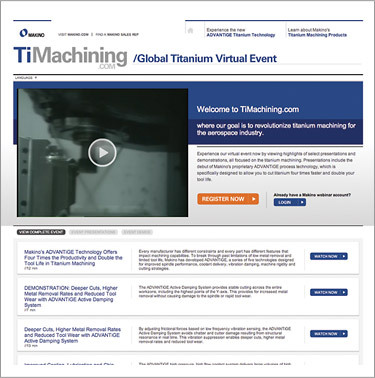 The website currently highlights a virtual event inspired by Makino’s Global Titanium Day held on May 20 at their North American headquarters in Mason, Ohio. The virtual event features 13 technical presentations and demonstrations from Makino’s designers and application engineers, covering a variety of new innovations in titanium machining. The launch of TiMachining.com marks the worldwide debut of Makino’s ADVANTiGE™ technologies—rigid machine construction, high-pressure, high-flow coolant system, Active Damping System, Autonomic Spindle Technology and Coolant Microsizer System—offering four times the productivity and double the tool life of conventional machining centers. Site visitors have the opportunity to gain detailed information on each technology through in-depth presentations and case studies. Other featured topics include Makino’s diverse catalog of milling and EDM titanium machining centers, including the a81M horizontal machining center, D500 5-axis vertical machining center, DUO43 wire EDM, EDGE3 Ram EDM with titanium booster technology and the company’s flagship T4 5-axis horizontal machining center. Join the titanium revolution for free today at TiMachining.com.